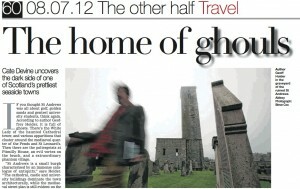 Glasgow’s Sunday Herald did a full-page feature on Haunted St Andrews in their 8th July edition. I tried to look windswept and interesting for the photo shoot in the Cathedral ruins, and gabbled on in my usual windbag fashion. The full piece can be read here, courtesy of the Sunday Herald and journalist Cate Devine. I’ll be doing a book signing at J & G Innes on Market Street in St Andrews on Saturday 21st July. Read the full article by clicking here, or the image to the left! This entry was posted in Promotional, Talks and Events and tagged cathedral, fortean, geoff holder, haunted st andrews and district, j & g innes, market street, Paranormal, scotland, sunday herald on 09/07/2012 by Jamie Cook.